The 2014 Crossfire 200GT Side by Side is an amazing addition to the Crossfire UTV collection. Presenting kids with the best value for money as well as safety. Unlike quads, the 200GT uses bucket seats with seat belts to provide the rider with the best available safety and comfort. The unique feature that makes the UTV/Side by Side stand out is the roll cage that comes standard on every machine. The Roll cage is great at giving extra protection to an otherwise exposed rider. There are obvious limitations to what any roll cage can do but the safety it provides is what puts the Crossfire 200GT miles ahead of any other quad. The IRS front suspension allows for a comfortable ride while maximizing the handling ability of the 200GT. The Crossfire 200GT is fully automatic with reverse, and is available with near infinite performance upgrades, as such it will find its place both on the paddock as well as on the dunes. The automatic transmission is smooth and responsive yet maintains its agility. This agility allows for an immediate on off throttle action with minimal delay in the drive train. 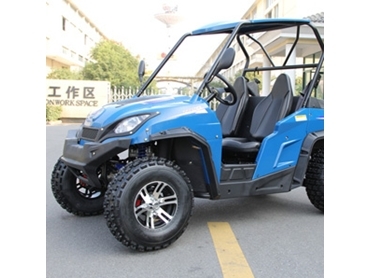 The model is here to compete with the Polaris RZR range, often used as the bench mark in the children’s Side by Side market. We believe the 200 GT doesn’t just step up to the plate but is the most serious contender in the current Kids Side by Side market. The 200cc engine is positioned in line with the chassis and not at 90degreess to the drive train allowing for straight drive from engine to axle. This means minimal power loss and maximising power to where it’s needed. To conclude, the Crossfire 200GT is the machine for the young ones all the way into their late teens with space to grow and power to excite.